As part of the measures to be implemented for the increasing number of foreign visitors, the Justice Ministry has been considering using facial recognition technology to streamline the departure and return processes for travelers. 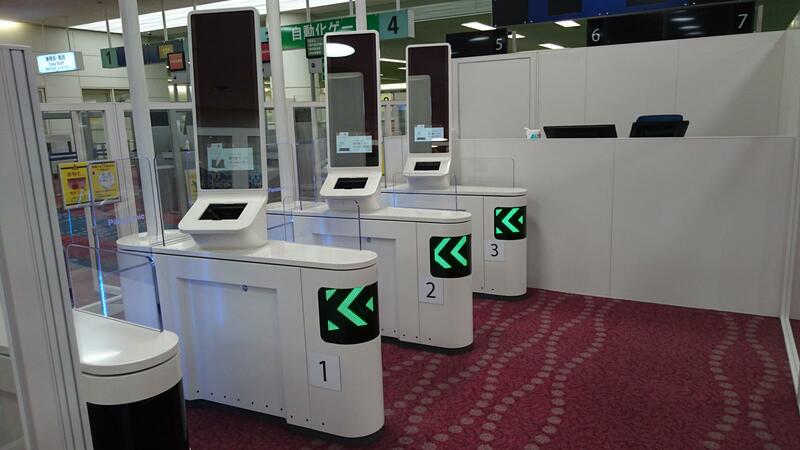 Since October 18th 2017, three units of Panasonic's Facial Recognition Gate have been put into operation at Tokyo International Airport's immigration control. The system is contributing to the smooth immigration examination of Japanese travelers returning home. Without the need for prior registration of biometric data, the system compares photographic data of the traveler's face in the IC chip embedded in the person's passport with a photo taken at the Facial Recognition Gate to verify the identity. Panasonic's Facial Recognition Gate was newly designed to streamline the departure and arrival processes of Japanese nationals, based on the concept of a simple, secure, and safe solution where both first-timers and the elderly can pass through the gate without delay, frustration, or confusion. (3) Spatial and overall service design that enables the optimal arrangement in limited spaces. Panasonic will continue to help authorities implement smooth and strict immigration control procedures at airports and seaports throughout Japan as the country aims to establish itself as a tourism nation toward 2020 and beyond. The company also aims to provide various solutions for consumers by combining its passport and facial recognition technologies. Panasonic has incorporated advanced technologies that meet a number of requirements considered necessary to operate the gate properly. They include the advance elimination of factors that can cause false rejections, countermeasures against unauthorised entry and a high-performance facial recognition engine. To improve usability, it has also achieved the following features through research and field trials in collaboration with external research institutes such as universities.